Hoffman dug deep to edge out Tyler Day successfully defending his title. Nolan Hoffman again outclassed a strong local field to secure a historic victory at the Tsogo Sun AmaShova Classic road cycling race in Durban on Sunday. 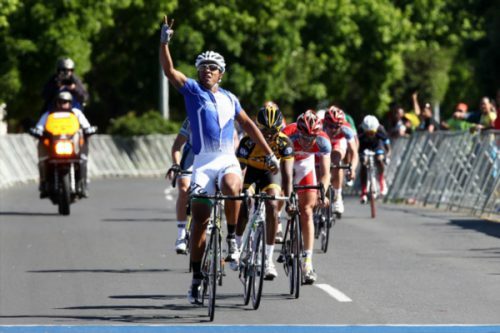 The Team Telkom rider won a bunch sprint to earn his fifth victory at the annual event, becoming only the second man (after six-time winner Malcom Lange) to win the race more than four times. James Tennent and Brendon Davids were involved in an early break, opening a gap of more than a minute on the peloton, but they were reeled in after the tough climbs in the middle of the 106km contest as the group set themselves up for a late dash. Hoffman dug deep to edge out Tyler Day (Westvaal BMC), successfully defending his title, while Herman Fouche took third place. “Luckily the weather was good today, which made for awesome riding,” Hoffman said after the race. Mauritian rider Kim le Court, turning out for the Time Freight outfit, won the women’s race in another later sprint between six riders who managed to open a gap on the peloton. Le Court reclaimed the title she earned two years ago, holding off South African champion and former winner An-Li Kachelhoffer (PTA Box), who finished second, with Time Freight teammate Vera Adrian of Namibia, the African champion, grabbing third place.